For a long time, I thought and taught that prayer is an important part of the Christian life. Somewhere along the way, I decided that in fact the Christian life is a life of prayer. How did I arrive at that conclusion? Like many realizations, it came over time. I had long thought of prayer as communion with God. Lots of people define prayer as communication with God, which it is, but it’s not only that. Communication grows out of and further develops our relationship with God, creating communion with God. The Christian life is lived in communion with God, so if prayer is communion with God, then the Christian life is a life of prayer. This Sunday’s lesson text reminds us that prayer grows out of and helps develop community. James calls us to pray for and with each other. As we do so, he says, we will experience greater wholeness. Christian community leads us to pray with and for each other. As we do so, our community grows stronger. God, who is also part of our community, directly works to make us whole. But perhaps sometimes—maybe even most of the time—the development of community between Christians and God and between Christians and Christians produces its own kind of increased heath and wholeness. The lectionary’s other texts for this week help us think a little more about community. Esther 7:1-6, 9-10, and 9:20-22 report the deliverance of the Jews from the murderous intentions of the Persian government official Haman through the actions of Esther and Mordecai. The Hebrew book of Esther is the only book in the Bible that doesn’t mention God. Someone decided to do something about this, which is why the Greek version of Esther has lots of prayers. We may assume that God is working behind the scenes in the Hebrew version. Still, if the Jews are to be delivered, Esther and Mordecai must act. In our Christian communities, we pray for God’s help. We also pray that God will show us what we can and should do to help each other. And then we do it. 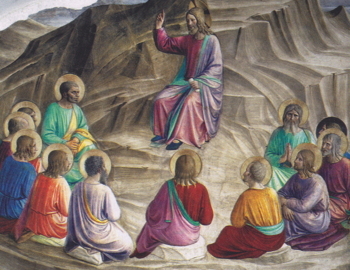 In Mark 9:38-50, Jesus’ disciple John says to him, “Teacher, we saw someone casting out demons in your name, and we tried to stop him, because he was not following us.” Jesus replies, “Do not stop him; for no one who does a deed of power in my name will be able soon afterward to speak evil of me. Whoever is not against us is for us.” This exchange reminds us that we should take care not to limit our definition of Christian community in ways that Jesus wouldn’t want us to. Praying for those who are outside our limited circle will help us expand our definition of community. Because we are a Christian community, we pray with and for each other. Because we pray with and for each other, we grow in being a Christian community. Because we grow in being a Christian community, we help each other and we accept each other. Because we help and accept each other, we become more healthy and whole. 1. How might “the prayer of faith…save the sick” (v. 15)? What is a “prayer of faith”? What does it mean for the sick to be saved? 2. What does the lesson text teach about our responsibility toward each other when we sin? 3. How likely are we to “confess [our] sins to one another” (v. 16)? What might cause us to hesitate to do so? Are there ways that we can realistically and constructively confess to each other? 4. What is James trying to say with his Elijah example? 5. Why is it important that we accept responsibility for one another? What role does prayer play in doing so? How else should we demonstrate our responsibility for each other? (5:19-20) Sinners Will Be Saved. The final promise concerns those who have abandoned their original life of Christian discipleship. Their fate is not irrevocably sealed; they may be brought back into the community of faith. The final phrase, “will save his soul from death and will cover a multitude of sins,” is somewhat ambiguous. The recipient of salvation and forgiveness could be either the reclaimer (so Cantinat, 262; Adamson, 202-204)— presumably as a reward for his/her endeavors—or both the reclaimer and the sinner, the former who thereby has his/her sins forgiven and the latter as the one who is saved by such a reclamation (so Ropes, 315-16; Dibelius, 258-60; Mussner, 253; Laws, A Commentary on the Epistle of James, 240-41). The problem with this is that the two phrases would more naturally be taken together with the one common predicate. More likely, therefore, is a third option that sees here a promise of salvation and forgiveness even for the apostate if she or he returns to the church (so Davids, 201; Moo, 190). Even the sin of apostasy can be “covered,” or forgiven (For the “covering” of sins see Ps 32:1; 85:2; Dan 4:24; Ecclus 5:6; Tobit 4:10; Rom 4:7), and thereby the penalty of eternal death (James 1:15; cf. Deut 30:19; Job 8:13; Ps 1:6; Prov 2:18; 12:28; 14:12; 15:10; 2 Esd = 4 Ezra 7:48; 2 Bar. 85:13) averted. A version of Proverbs 10:12 (MT, “Love cancels all offenses”; LXX, “Friendship [philia] covers all who do not love strife,” quoted as “Love covers a multitude of sins” in 1 Pet 4:8; 1 Clem. 49.5; 2 Clem. 16.4), seems to lie behind the letter’s final words. In later Christian writing this came to be considered a dominical saying (see Clem. of Alexandria, Tutor 3.91.3). Although not overtly stated, the implication is that a sinner’s reclamation is the result of prayer. No specific sin is mentioned. Rather, “the sinner” is the one who “wanders from the truth” (cf. LXX Isa 9:15; Jer 23:17; Ezek 33:10; 34:4 where this describes the idolater), i.e., one who has abandoned the Christian community. Unlike the Qumran Covenanters who cursed any member who subsequently left the group (1QS 2.13-14), or the author of 1 John (5:16) who places those who commit “mortal” sin beyond the pale of intercessory prayer, or the Letter to the Hebrews (6:4-6; 10:26), which gives the apostate no second chance (see Isaacs, Sacred Space, 93-97), James concludes with a promise, held out by way of encouragement even to the apostate, that restoration is possible; the wanderer who is led back into the Christian fold can be assured of God’s forgiveness and salvation. Marie E. Isaacs, Reading Hebrews & James: A Literary and Theological Commentary, Reading the New Testament (Macon GA: Smyth & Helwys, 2002) 249.